This article was published in the Fall 2015 Baseball Research Journal. It was selected as a winner of the 2016 McFarland-SABR Baseball Research Award. With a near-century now having elapsed, it is difficult to determine which event post-World War I baseball fans found more improbable: the Cincinnati Reds' defeat of the highly touted Chicago White Sox in the 1919 World Series, or the acquittal of the Sox players accused of dumping the Series at the ensuing criminal trial. The pretrial confessions of guilt made by four of the accused—Eddie Cicotte, Joe Jackson, Lefty Williams, and Happy Felsch—had rendered conviction a foregone conclusion to many. Thus, the not guilty verdicts rendered by the jury were unexpected, and in some quarters unfathomable. Although much has been written about the Black Sox Scandal, until quite recently comparatively little attention has been paid to its legal proceedings. For the most part, those commenting on courtroom events have been handicapped by misapprehension of what actually went on in and about the Cook County Courthouse, and by a lack of understanding of Illinois criminal law. Often, the trial has been summed up with the assertion that the prosecution’s case foundered on the disappearance of the player confessions in the run-up to trial—an erroneous but enduring notion in Black Sox lore. In truth, the confessions of Cicotte, Jackson, and Williams were available at trial, and read at length to the jury. But to no avail. The defendants, even those who had confessed their guilt, were all acquitted. Because the deliberations of a criminal case jury are conducted in private, and because jurors are not thereafter obliged to explain the reasoning behind their verdict, the grounds for the Black Sox acquittals are unknowable. It is, of course, possible that the prosecution failed because its proofs did not satisfy the jury of the defendants’ guilt. But that seems unlikely in the case of Eddie Cicotte, Joe Jackson, and Lefty Williams, and arguably that of Chick Gandil, Swede Risberg, and the gambler defendant David Zelcer, as well. Against these defendants, if not the others, the government presented ample proof of guilt. It is also conceivable that the jury verdict may have been corrupted by defense-friendly outside forces. But this, too, seems unlikely, as no evidence of jury tampering has ever surfaced. This article will assay another possible basis for the not guilty verdicts, one heretofore little discussed in the Black Sox canon: jury nullification. Jury nullification is an unpredictable but mercifully rare courthouse phenomenon. It involves the jurors’ knowing and deliberate rejection of evidence and/or their refusal to apply the law against a criminal defendant, in violation of the oath taken by all jury members at the outset of trial. This dereliction of duty may be precipitated by an overriding desire to send some kind of message to the community at large. Or because the result commanded by the evidence and the law runs contrary to the jurors’ personal sense of justice, morality, or fairness.1 Whatever its cause, prosecutors dread jury nullification and court decisions have condemned it.2 But the power of nullification exists nonetheless, and by virtue of the Double Jeopardy Clause of the Fifth Amendment, no recourse against those wrongfully acquitted is available to the government. In the writer’s view, jury nullification presents an eminently plausible explanation for the acquittal of the six most seemingly guilty defendants in the Black Sox criminal case. Argument of the point is premised on the following matters of fact and law. The other implicated Sox players reacted indignantly to the news leaking from the grand jury. Chick Gandil, Swede Risberg, Fred McMullin, and particularly Buck Weaver publicly protested their innocence, with Weaver vowing to retain the best lawyer he could find to fight any charges.12 Those charges would not be long in coming. On October 29, 1920, the Cook County Grand Jury returned indictments charging the eight targeted White Sox players, fix intermediary Hal Chase, and gamblers Joseph (Sport) Sullivan, Rachael Brown, Bill Burns, and Abe Attell with multiple counts of conspiracy to obtain money by false pretenses and/or by means of a confidence game. In November 1920, a Republican Party electoral landslide swept an entirely new administration into the Cook County State’s Attorney’s Office. Upon taking office in December, these new prosecutors found the heralded Black Sox case in disarray. The investigation was incomplete, evidence was missing from the SAO vault, and the staff attorneys most familiar with the case had moved on to private law practice. Worse yet, the former prosecutors had anticipated that the defendants who had confessed before the grand jury (Eddie Cicotte, Joe Jackson, and Lefty Williams) would turn state’s evidence and testify against their cohorts at trial. But with top-notch legal counsel now at their side, the three were standing firm with the other defendants. They were also seeking to have their confessions suppressed as evidence. Aside from unindicted co-conspirator Billy Maharg, this left the prosecution bereft of a fix insider whom it could build its case around. And employment of its crucial confession evidence was in jeopardy. Then catastrophe struck. In February 1921, Judge William E. Dever unexpectedly denied a prosecution motion for an indefinite postponement of further proceedings and gave the Black Sox case a short trial date. With the case in no condition to move forward, State’s Attorney Robert E. Crowe unilaterally dismissed the charges. Crowe, however, coupled this stunning development with a vow to re-present the charges to a newly impaneled grand jury. True to his word, Crowe had the matter back on the grand jury docket within a week, and in late March new indictments were returned in the Black Sox case. Now, the charges included substantive fraud counts, as well as the previous conspiracy ones. In addition to the original defendants, all of whom were re-indicted, the roster of those accused was expanded to include five new gamblers: Carl Zork and Benjamin Franklin of St. Louis, and a trio of Des Moines gamblers, David “Bennett” Zelcer and the Levi brothers, Ben and Lou. By representing the matter, prosecutors had gained the breathing space needed to put their case in better order for trial. But the addition of these new defendants would come back to haunt the prosecution. The criminal law of Illinois worked greatly to the prosecution’s advantage in the Black Sox case. The indictment’s core offense was conspiracy, an offense usually defined as an agreement between two or more persons to commit an unlawful act.13 In most jurisdictions, conspiracy charges also require an overt act, namely, action by at least one of the conspirators that takes the conspiracy past the talking stage. But not in 1919 Illinois. Under both its statutory and common law definitions of the offense, a conspiracy in that state was complete upon the mere agreement to commit the unlawful act.14 As elsewhere, moreover, conspiracy was an offense separate and distinct from the crime that was the conspiracy’s object. For example, conspiracy (agreement) to rob a bank is one crime, while the bank robbery itself is another—although conviction on the two offenses might later be combined for sentencing purposes. In the trial of the Black Sox, this relieved the prosecution of proving that the players had actually dumped the World Series, or any particular game. Illinois law only required proof positive that the accused players and gamblers had agreed to do so. In his self-serving 1956 account of the scandal, Chick Gandil maintained that the Black Sox players had gotten cold feet and never went through with their agreement to throw Game 1 or any other Series game.15 Under Illinois law, however, this purported abandonment of the fix would have provided no defense to the conspiracy charge in the indictment. That offense was committed the moment that the players and gamblers agreed to rig the Series outcome. A trickier task for the state was establishing that the object of the conspiracy—the fix of the 1919 World Series—was itself an unlawful act. Here, the prosecution was hamstrung by the fact that Illinois did not have a statute that criminalized the corruption of sporting events. Like other states, Illinois adopted a specific sports corruption statute in the wake of the World Series scandal, but this new law could not be applied retroactively to the Black Sox.16 This necessitated shoehorning the World Series fix charges into a conspiracy to commit some form of criminal fraud, such as obtaining money by false pretenses or via a confidence game. Ominously for the prosecution, a California court had recently rejected this gambit, dismissing an indictment returned against players and gamblers accused of fixing the 1919 pennant race in the Pacific Coast League.17 The Black Sox defense would expend considerable effort on having this ruling applied to the instant charges, but in the end trial judge Hugo M. Friend denied indictment dismissal motions, determining that application of Illinois fraud statutes to the Series fix was legally permissible. While matters of statutory construction went the prosecution way, application of the law was not all one-sided in the Black Sox case. Of particular benefit to the accused was the prohibition of hearsay evidence at a criminal trial. Generally speaking, hearsay is testimony about out-of-court statements made by someone other than the witness on the stand.18 During grand jury proceedings, any form of evidence, including hearsay, can be utilized by prosecutors. But at a criminal trial, the rules are different. In particular, the Confrontation Clause of the Sixth Amendment guarantees the accused the right to confront and cross-examine the evidence offered against him. And obviously, inanimate objects like a grand jury transcript or a newspaper article cannot be cross-examined. To use such evidence, the prosecution must put the statement’s author on the witness stand. In the Black Sox case, the indictments returned against the non-confessing defendants had been grounded largely on the grand jury testimony of Eddie Cicotte, Joe Jackson, and Lefty Williams. At trial, those statements would be admissible against the individuals who had made them. But unless Cicotte, Jackson, or Williams took the stand as a prosecution witness, their grand jury testimony was hearsay and could not be used as evidence against Gandil, Weaver, or anyone else on trial. This left the prosecution in urgent need of cooperation from a fix insider who would be willing to take the witness stand and subject himself to defense cross-examination. On the eve of trial and in return for immunity, codefendant Bill Burns came to the prosecution’s rescue. D. THE CRIMINAL TRIAL OF THE BLACK SOX CASE. Among the problems facing the prosecution was an elementary one: getting the defendants, almost all of whom lived outside of Illinois, into court. In the end, the problem was only partially overcome. The Sox players, hoping for vindication and a return to the game, appeared voluntarily. But Fred McMullin did not arrive from California until after jury selection had begun. This necessitated a severance and deferral of McMullin’s trial to some future date. The gambler defendants were another matter entirely. Sport Sullivan and Rachael Brown could not be found by authorities; Hal Chase and Abe Attell defeated attempts to extradite them to Illinois, and Ben Franklin was excused from the proceedings on grounds of illness. Thus, the only gamblers to stand trial were Carl Zork, David Zelcer, and the Levi brothers. The jury selection process was arduous, its length protracted by defense counsel efforts to indoctrinate prospective panel members with bias favoring the defense point of view, and prosecution attempts to gauge juror receptivity to testimony by a cooperating former defendant. 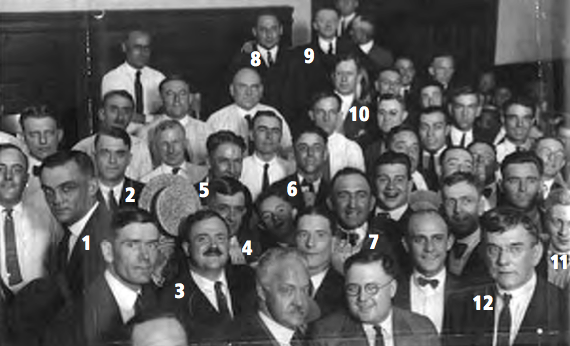 Finally, a jury of 12 white men, all reportedly non-baseball fans, was chosen. The Black Sox trial then began with an extended opening address by the lead prosecutor, Second Assistant State’s Attorney George E. Gorman. In sometimes dramatic tones, Gorman delineated the Series fix roles played by both the defendants in court and absent confederates like the non-indicted Arnold Rothstein and the unavailable Abe Attell. When their turn came, defense lawyers waived opening speeches, preferring to maintain silence for the time being. Seeking to regain momentum, the prosecution proffered the Cicotte, Jackson, and Williams grand jury testimony.21 But before it could be read to the jury, Judge Friend had to rule on the defense’s challenge to its admissibility. With the jury excused from the courtroom, Eddie Cicotte, Joe Jackson, and Lefty Williams testified that their grand jury confessions had been induced by off-the-record promises of leniency made by White Sox counsel Alfred Austrian and grand jury prosecutor Hartley Replogle.22 Replogle and other prosecution witnesses denied it. Finding the prosecution account of disputed events the believable one, Judge Friend determined that the grand jury confessions had been voluntarily given and could therefore be presented to the jury—but only after the confessions had been edited to eliminate reference to non-confessing codefendants. While this process, called redaction, was being undertaken back at SAO offices, Judge Charles McDonald, the presiding justice of the Cook County criminal courts, testified before the jury. According to the judge, Cicotte, Jackson, and, to a lesser extent, Williams had each admitted his fix guilt in chambers prior to their grand jury appearances. At the conclusion of the McDonald testimony, the State returned to the player confessions. But the redaction process had deleted the explicit mention of defendants Gandil, Risberg, Felsch, and Weaver that the grand jurors had heard. Each place where one of their names appeared in the grand jury transcripts, it was replaced with the anonym Mr. Blank. When presented to the jury by means of a dialogue between Special Prosecutor Edward A. Prindiville and grand jury stenographer Walter Smith, the repeated references to Mr. Blank rendered substantial parts of the narrative unintelligible. Compounding this problem was the stifling heat in the non-air conditioned courtroom. Between the droning of the Prindiville/Smith duet and the oppressive courtroom heat, the jury may well have been anesthetized. With its case again in need of reviving, the prosecution then summoned Billy Maharg. Like Bill Burns, Maharg provided a firsthand account of various aspects of the fix, identifying defendant Zelcer as “Bennett” and putting all the accused players, save Jackson, deeply into the plot. Like Burns, the affable and guileless Maharg cruised through cross-examination, with defense lawyers hardly laying a glove on the one-time Philadelphia club fighter. Their case refreshed by the Maharg testimony, prosecutors then made a tactical decision to abbreviate their case. Jettisoning prospective witnesses like Browns second baseman Joe Gedeon and St. Louis gambler Joe Pesch who might have bolstered the flagging case against the Midwestern gambler defendants, the prosecution rested. In doing so, the state effectively abandoned the charges against Carl Zork and the Levi brothers. Viewed in retrospect, narrowing its focus to the case against the Sox players and David Zelcer was an unremarkable move, the kind of decision that prosecutors routinely have to make on the fly during a trial. And wrapping up the government’s case on a seeming high note was a sound stratagem, given the circumstances. But what does not make any sense is the prosecution’s failure to tighten the noose around Happy Felsch before it rested. This could have been accomplished by having Chicago Evening American reporter Harry Reutlinger inform the jury of the abject admissions of guilt that Felsch had made back in September 1920. Given that testimony by an objective, non-partisan witness like Reutlinger would have been brief, effective, and virtually unimpeachable, the prosecution’s failure to call him as a witness is a mystery. When it came time for the defense to take the floor, the gamblers went first. Testifying on his own behalf, David Zelcer unequivocally denied acquaintance with Bill Burns and Billy Maharg, and denied any involvement whatsoever in the plot to fix the 1919 World Series. The Zelcer claims of innocence and his semi-alibi defense, however, were both undermined by effective cross-examination by Special Prosecutor Prindiville and by prosecution rebuttal evidence. The Zork defense wisely kept its client off the stand, confining its presentation to good character evidence, and four respectable fact witnesses who eviscerated the testimony of the government’s lone witness against Zork, embittered East St. Louis theater owner/gambler Harry Redmon, a heavy betting loser on the 1919 Series. Then it was the players’ turn. The Gandil defense preceded promised testimony from Chick with a parade of witnesses intended to make a liar of Bill Burns, but with little apparent effect. Then, with the courtroom gallery poised for Chick to take the stand, the Gandil defense rested. The other player defendants promptly rested their cases, as well. Caught off-guard by defense maneuvers, prosecutors scrambled to collect rebuttal witnesses, including Harry Reutlinger. But given that little by way of a defense case had been offered, Judge Friend barred most of the proffered rebuttal, rightly scoring prosecutors for not using Reutlinger earlier. Shortly thereafter, the proof-taking portion of the Black Sox case closed. The Black Sox joy was short-lived. Even before the verdict was fully digested, Commissioner Kenesaw Mountain Landis issued his famous edict permanently banning the acquitted players from Organized Baseball. And with that, Joe Jackson, Eddie Cicotte, Buck Weaver, and the others were consigned to the wilderness, playing out their careers in outlaw baseball. As in most multi-defendant criminal matters, the proofs arrayed against the accused in the Black Sox case were uneven, strong against some defendants, weaker against others. Regarding the latter, Constitutional constraints and evidence rules had had significant effect, precluding the use at trial of incriminating evidence earlier presented to the grand jury. Critically, the bar on hearsay drained content from the grand jury confessions, and the trial jurors never got to hear Chick Gandil, Happy Felsch, Swede Risburg, Buck Weaver, and the absent Fred McMullin named as fix participants by Eddie Cicotte, Joe Jackson, and Lefty Williams. And inexplicably, the prosecution did not move to present Happy Felsch’s self-incriminating newspaper interview until it was too late. Nevertheless, this does not satisfactorily explain the not guilty verdicts, at least those rendered upon some of the defendants. For the reasons which follow, it seems more than likely that the acquittals of Eddie Cicotte, Joe Jackson, and Lefty Williams, and perhaps those of Chick Gandil, Swede Risberg, and David Zelcer, as well, were the product of jury nullification. The legal dictionary definition of jury nullification has already been provided. But in essence, jury nullification substitutes emotion for reason. To disregard their solemn promise to base their verdict on the evidence presented at trial and the law as explained by the court—and nothing else—jurors must be overcome by some powerful impulse. In certain instances, jurors may form an attachment to the accused. Or become consumed by dislike of prosecution witnesses. Or lack sympathy for the crime’s victim. Whatever the basis, jury nullification is more likely to occur in highlycharged cases, like the Black Sox matter. The prosecution proofs against reputed fix enforcer Swede Risberg were respectable enough, provided that the testimony of Bill Burns and Billy Maharg was believed, a problematic matter for prosecutors. This was because in 1921, as today, criminal case jurors tend to disdain testimony by cooperating codefendants. Indeed, juror dislike of “rats” is almost reflexive, even though such witnesses may be as sharp on the stand as Burns or as affable as Maharg.35 In a postverdict disclosure, one anonymous Black Sox juror stated that Burns had not made a “favorable impression” on the panel. That, however, does not mean that the Burns [or Maharg] testimony was not worthy of belief, particularly given that its recitation of fix events seemed to coincide with the details of the Cicotte, Jackson, and Williams confessions. The same holds true for David Zelcer, except in his case, he was not a popular hometown ballplayer like Swede Risberg, but an admitted Sinton Hotel roommate of the sinister, if missing, Abe Attell. Zelcer, moreover, had interposed a partial alibi defense—he claimed to have been in Chicago on the date that Burns and Maharg had him in attendance at a fix meeting in New York—that seemed to backfire. Hauled back to the stand as a government rebuttal witness, hotel clerk Harold Schwind recanted his earlier pro-Zelcer testimony, rendering the alibi a nullity, at best. The consequences here were dangerous for Zelcer, as criminal case juries usually convict defendants seemingly caught in a lie. Stronger still was the prosecution case against Chick Gandil. Manifestly, the evidence against Gandil rested largely on the testimony of Burns and Maharg. But even without them, Gandil seemed, ineffably, to be involved in the fix. And the admonition of the court against speculation notwithstanding, it would have been difficult for jurors not to conclude that Gandil was one of the Mr. Blanks mentioned in the Cicotte, Jackson, and Williams confessions. Indeed, of all the Black Sox, Gandil was the most likely Mr. Blank to have been the fix ringleader. Regarding the question of whether the accused had entered such an agreement, the jury did not have to accept the testimony of a Bill Burns or a Billy Maharg. Or even that of the respected Judge McDonald. Conviction only required the jury to accept the word of Eddie Cicotte, Joe Jackson, and Lefty Williams himself, as each had confessed to agreeing to the fix of the 1919 World Series in his grand jury testimony.37 And all three had admitted taking payment for the deed, besides. Once those confessions were admitted in evidence at trial, the guilt of Cicotte, Jackson, and Williams on the conspiracy charges was facially incontestable. In attempting to explain an inexplicable verdict, one commentator has suggested that the acquittals may have been prompted by an aspect of Judge Friend’s final instructions to the jury.38 To convict on the charges, the court directed, the proofs had to show not only that the accused had agreed to fix the World Series, but that in doing so, their conscious intent had been to defraud the public and/or the other victims specified in the indictment (i.e., club owner Charles Comiskey, the White Sox corporation, fellow White Sox teammates, and Chisox bettors). But conscious intent to defraud was self-evident, as in-the-know gamblers like Sport Sullivan, Abe Attell, and Arnold Rothstein would have found it impossible to place their high-stakes bets without it—for who would have bet on the White Sox if the corruption of the Series outcome was public knowledge? Besides, post-verdict juror comments indicate that the panel had resolved to acquit the defendants as soon as the state rested its case, and well before it even heard the legal instructions of Judge Friend. In sum, the instructionsto-the-jury hypothesis is a non-starter. In addition to providing the only comprehensible basis for the not guilty verdicts returned against at least some of the Black Sox defendants, jury nullification is betrayed in both the record and historical circumstance. Beginning with the jury selection process, defense counsel strove to have the mostly working class jury pool identify with the blue collar ballplayers. Even if their dubious disclaimers of much interest in baseball were credible, the jurors’ post-verdict comments demonstrate that they had grown fond of the player defendants as the trial progressed, and wished them well. Not likely so with the victims, particularly White Sox owner Charles Comiskey. Old and ailing, Comiskey had been baited into a blustery self-righteous outburst by defense counsel Short in the early trial going, an incident that served defense purposes nicely. From the outset, the defense had attacked Comiskey’s character, portraying him as an uncaring, skinflint owner and as a putative victim unworthy of juror sympathy. In fact, Comiskey was a decent man and a relatively generous employer. The 1919 Chicago White Sox had the second highest payroll in major league baseball, and a number of Sox players (with third baseman Weaver and pitcher Cicotte among them) were at or near the top of the pay scale for their respective positions.39 But the jury did not know this, and the imbalance between the life stations of the well-heeled Charles Comiskey and his working class ballplayers (and the Black Sox jurors) was doubtless accentuated by testimony about the handsome profits made by the Chicago club during the 1920 season. The fix of the 1919 World Series had not grievously injured its leading victim. He was doing great. Throw in defense counsels’ bristling summation argument that the accused players were also the innocent victims of some vague but malevolent scheme of American League President Ban Johnson, and all the ingredients for jury nullification were in place. Those who acquitted the Black Sox went to their graves long ago, taking any explanation of their verdict with them. All that can be said for it is that Judge Friend, a fair-minded and able jurist, found their judgment a “just” one. And perhaps it was as to some of the defendants. But not when it came to Eddie Cicotte, Joe Jackson, and Lefty Williams, at a minimum. Regarding those three, the verdicts were inconsistent with the mandate of Illinois law on conspiracy and the overwhelming weight of the evidence presented at trial. In the final analysis, those particular verdicts may have been nothing more than the product of an indiscriminate acquittal stampede in the jury deliberation room. Or their verdicts may have been simply irrational, and thus inexplicable. But if the question why Eddie Cicotte, Joe Jackson, and Lefty Williams beat the charges in the Black Sox case must have an answer, jury nullification is the best one that examination of the record affords. Prior to his retirement in 2007, BILL LAMB spent more than 30 years as a state/county prosecutor in New Jersey. He is the editor of "The Inside Game," the newsletter of SABR’s Deadball Era Committee and the author of "Black Sox in the Courtroom: The Grand Jury, Criminal Trial and Civil Litigation" (McFarland, 2013). He can be contacted via e-mail at wflamb12@yahoo.com. 1. See Black’s Law Dictionary, Bryan A. Garner, ed. (St. Paul: West Publishing Co., 9th ed., 2009), 936. 3. Although Weaver was in attendance at each of the three pre-Series fix meetings, he denied accepting any payoff money and resolutely maintained his innocence of fix complicity. But in civil litigation later instituted by various White Sox players, fix gamblers Bill Burns and Billy Maharg placed Weaver inside Room 702 of the Sinton Hotel when a fix installment was paid after the Sox lost Game 2. For more detail, see William F. Lamb, Black Sox in the Courtroom: The Grand Jury, Criminal Trial and Civil Litigation (Jefferson, North Carolina: McFarland, 2013), 156–57. 5. See the Philadelphia North American, September 26, 1920. 6. The transcript of Cicotte’s grand jury testimony has not survived, but portions of it are preserved in a June 1923 Cicotte deposition, read into the record of Joe Jackson’s subsequent civil suit against the White Sox. The Jackson civil suit transcript is preserved at the Chicago Baseball Museum. Compare Jackson Trial Transcript, 1274–75, 1294–95, to the Associated Press dispatch published in the Los Angeles Times, September 29, 1920, and elsewhere. 7. The transcript of Jackson’s grand jury testimony is one of the few surviving artifacts of the Black Sox criminal case. The transcript can be accessed online at http://www.1919blacksox.com/transcripts1.htm. 9. Williams Grand Jury Testimony, 30. 10. Chicago Evening American, September 30, 1920. 12. See the Boston Globe, Chicago Evening Post, and The New York Times, September 29, 1920. 14. As subsequently affirmed by Illinois highest court in People v. Lloyd, 304 Ill. 23, 136 N.E. 505 (Ill. Sup Ct. 1922). 15. Chick Gandil as told to Mel Durslag, “This Is My Story of the Black Sox Series,” Sports Illustrated, September 17, 1956. 18. See Black’s Law Dictionary, 7th ed., 585. 19. Typical was the review of the Los Angeles Times, July 22, 1921: “The State’s chief witness … hurled excellent ball, permitting the defense few hits in the grilling cross-examination.” For other press raves about the Burns witness stand performance, see the Chicago Tribune, July 22, 1921, and The New York Times, July 23, 1921. 20. Some years after the trial, jury foreman William Barry would tell Judge Friend that the Grabiner testimony had more effect on the jury than that of any other witness. See the Eliot Asinof papers, circa 1963 FriendAsinof interview, in the white penny notebook, Chicago History Museum. 21. Decades after the fact, ill-informed Black Sox commentators would assert that the Cicotte, Jackson, and Williams grand jury confessions had been lost and were thus unavailable when the case came to trial. But the only things lost (stolen from the SAO evidence vault) were the original transcriptions of the testimony. The theft was discovered well in advance of trial and immediately remedied by having grand jury reporters Walter Smith and Elbert Allen create new transcripts from their shorthand notes of the Cicotte, Jackson, and Williams testimony. The authenticity and accuracy of the second generation transcripts were not disputed by Black Sox defense counsel at trial. 22. Important from an historical perspective, neither Cicotte nor Jackson nor Williams maintained that what they had told the grand jury was untrue. Rather, the defense wanted the confessions thrown out on legal grounds, asserting that reneged prosecution promises of leniency rendered the confessions involuntary in the Fifth Amendment-sense, and thus inadmissible as evidence. Joe Jackson’s later claim of complete non-involvement in the Series fix was not unveiled until his April 1923 deposition for the back pay law suit that he instituted against the White Sox. 23. The Levi brothers had been targeted for prosecution by American League President Ban Johnson, the silent underwriter of much of the State’s case. But little incriminating evidence was presented at trial against Lou, and none at all against Ben. Indeed, prosecutors interposed no objection to dismissal of the charges against the Levis once the State’s case rested. 24. Later in the case, things got so hot between Frumberg and lead prosecutor George E. Gorman that the two almost came to blows. Gorman subsequently apologized and asked that his remarks about Fromberg be stricken from the record, as reported in the Chicago Herald Examiner, July 29, 1921. 27. Chicago Tribune, August 3, 1921. 28. Published in the Chicago Tribune, August 3, 1921. 29. As reported in the Los Angeles Times, August 3, 1921. 31. As quoted in the Los Angeles Herald Examiner, August 3, 1921. 32. Per the Des Moines Evening Tribune, August 3, 1921. 33. As reported in the Des Moines Evening Tribune and Los Angeles Herald Examiner, August 3, 1921. 34. Originally, Zork and Franklin were alleged to have instigated a fix revival attempt after the corrupted Sox players went rogue and unexpectedly won Game 3 of the Series. Discarded prosecution witnesses like Joe Gedeon and Joe Pesch would have filled in the details had prosecutors not decided to short-circuit their case during trial. Apart from the likely malice of AL President Ban Johnson, the impetus for the indictment of the Levi brothers is unknown. At trial, the prosecution proofs were embarrassingly meager, consisting of the fact that Lou Levi had been seen in the company of fix villain Abe Attell while the Series was ongoing, and that the brothers had won heavily betting on the Reds. 35. Except in organized crime cases tried in federal court [where jurors seem to give a dispensation to government use of the low-life witnesses], prosecutors will avoid using testimony by codefendants, if at all possible. The writer, a retired state/county prosecutor in New Jersey, went 24 years [from 1982 to 2006] between putting a cooperating codefendant in front of a jury. 37. While on the witness stand testifying in support of the back pay lawsuit that he had initiated against the White Sox, Jackson denied—more than 100 times—that he had made the statements reposed in black-andwhite in the transcript of his grand jury testimony. First astonished, then outraged, Wisconsin Circuit Court Judge John J. Gregory cited Jackson for perjury and had him incarcerated over night. Thereafter, Judge Gregory vacated the judgment awarded Jackson by the civil jury and dismissed the case. For more detail, see Lamb, 170–88. 38. See James Kirby, “The Year They Fixed the World Series,” American Bar Association Journal, February 1, 1988. 39. The longstanding notion that the Black Sox were underpaid is demolished by Bob Hoie in “1919 Baseball Salaries and the Mythically Underpaid Chicago White Sox,” Base Ball, A Journal of the Early Game, Vol. 6, No. 1 (Spring 2012); “Black Sox Salary Histories,” The Inside Game, Vol. XIII, No. 1 (February 2013), and “Black Sox Salary Histories: Part II,” The Inside Game, Vol. XIII, No. 2 (May 2013).